There are some exciting music projects coming up this term, which is set to be busy once again. I am delighted to have begun working as a music teacher at a special school for children with additional support needs. It’s an amazing place to work and I’m looking forward to the challenge, which alows me to build on my experiences with Magical Music workshops with East Lothian and for Artlink Central earlier in the year. Meanwhile, bookings are coming in for the academic year for Notes on a Story for P1-P3 children with East Lothian schools and I’ll also be doing Surround Sound again in the summer term. Surround Sound had another successful year, particularly at Law Primary School in North Berwick where it was incorporated into a much bigger cross-curricular school project. I have written an article about the experience that is planned for the next edition of Music Education UK, which I’ll say more about nearer the time. Like my other workshops, Surround Sound is adaptable to a number of different situations. One of the themes is touches upon is that of archaeoacoustics, the study of sound in archaeological contexts, and Archaeology Scotland have approached me to assist in researching and preparing teaching material on archaeoacoustics for use in the classroom. It’s another exciting project and I will be drawing on my archaeological experience as well as classroom and music teaching to help bring this together. We are also less than two weeks away from new terms beginning at Scots Music Group, where I’ll be teaching Beginners’ tin whistle; Fun Flute in Portobello, flute and whistle classes for all abilities; and Portobello Music School, where I’ll be teaching music to Primary 1 children for the second year running. 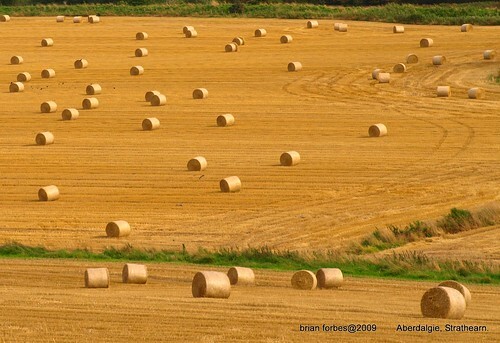 Photo of Harvest Time in Strathearn, Perthshire by Brian M Forbes. Some rights reserved. This entry was posted in classes, Community, Fun Flute, Schools, Workshops and tagged advanced, beginner, classes, East Lothian, edinburgh, flute, improver, portobello, Scots Music Group, Surround Sound, tin whistle, traditional music, workshops. Bookmark the permalink.